There are many variations of the classical margarita, many of them are prepared with different fruits to obtain a wide range of flavors. But if you want a drink with class and very fine – you have to try the gold margarita. It is a drink for the true tequila tasters as it is prepared with a very fine tequila, with “Gold Tequila". This margarita is strong and it has a sweet taste since the gold tequila goes through a coloration and caramelization process. It also has a slight orange taste coming from the Triple Sec liqueur. – The gold margarita is normally served in a salt rimmed cup and garnished with lime, to which no one can resist. And if it is accompanied with some typical Mexican appetizer , success is guaranteed. This recipe is very easy to make, you only have to learn some tricks that will be given along the way. 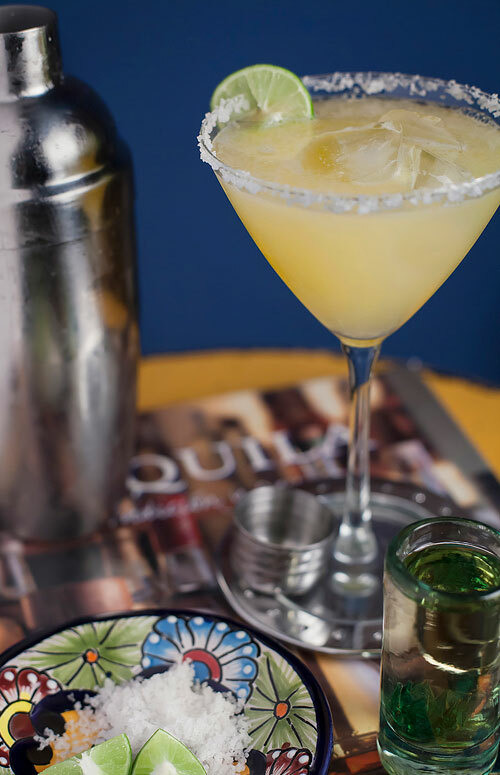 We recommend preparing the gold margarita with Jose Cuervo Tequila or Herradura Tequila. This drink is also prepared with triple sec liqueur and we recommend the Cointreau Triple Sec or the Grand Marnier. The margaritas will be ready in 5 minutes . Put on a small plate 1 tablespoon of salt and reserve. Pass 1/4 of a lime through half of the external rim of 2 cups. Pass the half of the external rim that has lime, of the 2 cups, through the salt that was served; then set aside. In this way only one half of the rim will have salt and the other half of the rim won’t have salt and you can choose from which side to drink – the one you like the most. 1 oz of Gold Tequila. 1 oz of Triple Sec. 1 oz of Lime juice. 1 teaspoon of Fine Grained Sugar. Shake very well the cocktail shaker, until the fine grained sugar has dissolved. Pour in the 2 cups that were prepared the gold margarita, without adding the ice cubes. If you want to enjoy the gold margarita on the rocks, just add new ice cubes in the gold margarita. Suggestion: This margarita can be garnished by putting 1 lime slice on the cup rim. Did you like the Margarita? Prepare your drinks with exactitude, with this measuring tool. Mix your cocktails to perfection. Squeeze the limes in an easy and practical way with the “OXO Lime Squeezer".